89% of buyers admit that their buying decisions are influenced by positive reviews and customer testimonials, and 88% of customers trust testimonials as much as a recommendation from a friend or family member. In fact, customer testimonials are the most effective form of user-generated content today. But simply having customer testimonials on your site is not enough; you must have the right kind of testimonials and you also must put them in the right places, such as your homepage, relevant service pages, and contact pages, for example. While you’re at it, add testimonials to your Facebook page, Twitter, Instagram, and other social profiles. The testimonials you list should be credible, never fake, and as close to excitement as your satisfied customers can get. The following five tips will allow you to maximize the effect testimonials have on your web presence, leading to more conversions and higher return. Get customer testimonials that build excitement in your target audience. Contact us for a free consultation. Customer testimonials should be from your target audience members. Testimonials must be relatable. If your target audience is Head of Customer Support, for example, do not get testimonials from Sales or IT Managers. In the testimonial, have the customer mention his successes thanks to your product. Look below to see how support leader, Zendesk, does it. When new visitors read testimonials from people just like them, they will relate and subconsciously follow suit. Of course, getting people to tell their friends about your product works best: it is a positive review from a trusted source who has similar needs. Testimonials from target audience members work in much the same way. Testimonials should highlight benefits. For example, if you are selling an online marketing tool that helps customers increase the leads they collect, your testimonial shouldn’t just say “this product is the best.” Instead, it should detail the benefit of increasing leads. Look at this example for small businesses using SalesForce. Providing a testimonial about specific benefits is essential as these are the takeaways you want new site visitors to remember. Additional points for the testimonial being in video format! Though you should avoid bad-mouthing competitors on your website, when customer testimonials compare your service to another, it may work in your favor. Look at the comparison below provided by Google Analytics. On your site, in your own words, stay positive and maintain focus on what your product can deliver. Customer testimonials, however, are not in your voice; they can (and should) compare your product to another and explain why yours is better. Of course, do not choose only comparative testimonials, but among the ones you display on your site, sprinkle in a couple that position you above your competitors. Testimonials show your prospects that your organization cares about customer satisfaction. Contact Spectoos to find out how to gather testimonials that get results. Always show the first and last name of the reviewer. Add as much relevant information as possible. For B2C sites, add a city and state. For B2B sites, add the name of the reviewer’s company and their title. 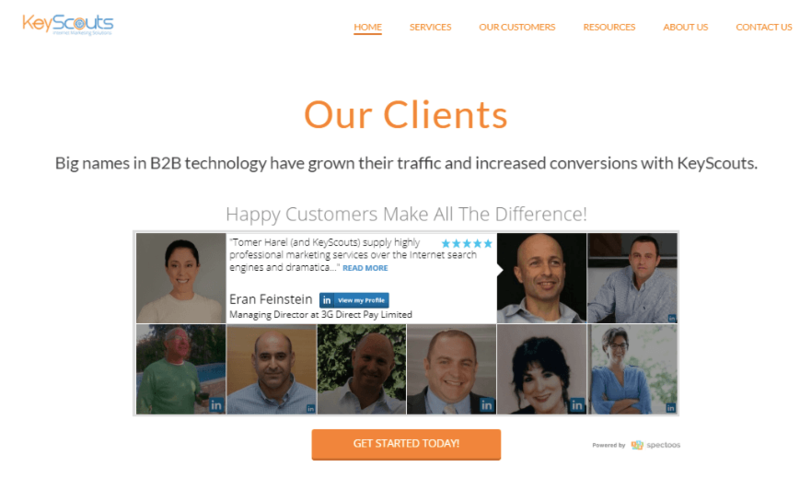 Here is how KeyScouts, a B2B marketing agency, shows credible testimonials. Some people, especially in the B2B sector, prefer anonymity. In some cases, being quoted in their official capacity requires sign-off from their marketing department and is just a hassle. Opt to showcase the testimonials that are proud to rave about their experience with your product. In fact, some companies will view such exposure as additional marketing for them, creating a win-win. Inserting a profile image to go along with a testimonial adds even more credibility. If the identity of the person attesting to your services can be verified (for example, a click on the profile image that directs to their social media profiles), credibility goes up another notch. Never write a fake customer testimonial. Don’t even write them and have real customers sign off on them. Testimonials must be real comments from real customers. People will be able to see through the fake ones. Testimonials, when done right, boost conversions. It has been proven time and time again. In fact, 97% of consumers feel that user-generated content like customer testimonials are more credible than other types of content. The customer testimonials on your site should be from individuals who most closely resemble your target consumers. The rave reviews should highlight the benefits of your product, and on occasion should compare your offerings to your competitors. At Spectoos, we have developed ways to get customer testimonials that enable you to build credibility while enticing your customers.